Lauren Larsen's Love, Light & Laughter: Lighten Up! Years ago, I spent an evening with a grown man dressed in spandex tights, dark glasses, and a big bulbous red outfit that was allegedly a blood drop. Thankfully, it was not a date. His name was Elmer, and he was pushing 90 at the time. His jokes were bad and his singing worse. He was part of the “entertainment” at a blood center event in Michigan at which I was giving the keynote address. I like to think of myself as an engaging speaker but, truly, it was Elmer who stole the show that night. For decades, Elmer had been the perfect example of a “loyal” blood donor. Every eight weeks he was at the blood center rolling up his sleeve. When he turned 87, he began taking medication that permanently deferred him from donating. 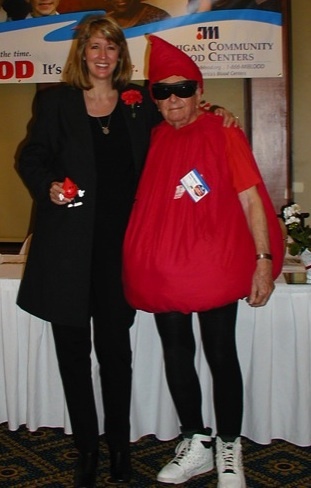 And that’s when Elmer morphed into his new role as the joke-telling, hand-holding, off-key-singing blood drop that showed up at blood drives to help ease the tension for first-time donors by sharing a laugh with them. Can you imagine any first-time donor being nervous once they laid eyes on him? At times, the joke was on Elmer: More often than not, people mistook him for a polyp! In my work with blood centers over the years, I’ve seen some fairly bizarre stuff – and by bizarre, I mean fun! I’ve seen grown adults shouting out their financial pledges just to see a colleague get shaved. I watched a blood center CEO take a pie in the face for the sake of employee morale (my own hand might’ve been on the pie tin at the time). I’ve seen a blood drive recruiter wear more red at one time than should be legal (you know who you are, Dan). I’ve witnessed collections staff forming instantaneous human pyramids and blood recipients dressing as bloodhounds and howling their way around town on scavenger hunts. And two weeks ago at the Association of Donor Recruitment Professionals’ meeting, I saw Wayne’s World mullets and teased-out Cyndi Lauper hair, parachute pants, and off-the-shoulder new wave tunics being sported by a group of crazed blood banking professionals on a jam-packed dance floor. All this “bizarre-ity” adds up to a heck of a lot of fun. Let’s face it: Working to save lives through blood transfusion is serious business. Those who work in blood banking have all met the patient with a remarkable medical story involving massive amounts of blood. Or the doctor working in a rural community who ran short on O-neg. Or the parent who lost a child after years of cancer treatments involving regular transfusions. Many have experienced the scare of a severe blood shortage, or the challenge of managing donor turnout after a horrific event like the Virginia Tech shootings, 9/11, or Hurricane Katrina. All too often, those of us who work in "life or death" situations--whether it's blood banking or critical care in the hospital or disaster relief--feel the weight of our responsibility on a regular basis, and we lose touch with the lighter side of our personalities. After all, patients are depending on us, so we must take our work seriously. But that doesn’t mean we must always take ourselves seriously. So I say: Lighten up! That, and impose an age limit on wearing spandex.